Drug Uses Furosemide is a powerful diuretic. Furosemide is used to treat excessive fluid accumulation and swelling (edema) of the body caused by heart failure, cirrhosis, chronic kidney failure, and nephrotic syndrome. It is sometimes used in conjunction with other blood pressure pills to treat high blood pressure. How to use Take furosemide exactly as directed by your doctor. If you do not understand these directions, ask your pharmacist, nurse, or doctor to explain them to you. Take each dose with a full glass of water. To reduce nighttime urination, take furosemide early in the day unless otherwise directed by your doctor. It is important to take furosemide regularly to get the most benefit. Do not stop taking furosemide suddenly even if you feel better. Stopping suddenly could make your condition worse. 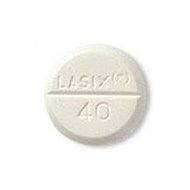 Drug Class and Mechanism Furosemide is a potent diuretic (water pill). Furosemide works by blocking the absorption of salt and fluid in the kidney tubules, causing a profound increase in urine output (diuresis). The diuretic effect of furosemide can cause body water and electrolyte depletion. Therefore, careful medical supervision is necessary during treatment. Missed Dose If you take one dose daily, take the missed dose as soon as you remember within 12 hours. If more than 12 hours have passed, skip the dose you missed and take only the next regularly scheduled dose. Do not take a double dose of this medication. If you take more than one dose daily, take the missed dose up to 2 hours late. If more than 2 hours have passed, skip the missed dose and take only the next regularly scheduled dose. Do not take a double dose of this medication. Storage Should be stored at room temperature in a light resistant container. Patients allergic to sulfa may also be allergic to furosemide because of a similarity in the chemical structure of the medications. Furosemide should be avoided in kidney failure. Even though furosemide is important in treating excess fluid accumulation in patients with cirrhosis, sudden loss of fluid and electrolytes in these patients can worsen kidney function and even cause the patient to go into a coma. Furosemide can cause lowering of blood potassium, sodium, and magnesium levels. Low potassium and magnesium levels can lead to heart rhythm abnormalities, especially in patients already taking digoxin (Lanoxin). Please visit the digoxin (Lanoxin) site for further information. Blood uric acid levels can increase during furosemide treatment, but precipitation of acute gout is rare. Furosemide may increase the toxic effect of aminoglycoside antibiotics on the ear, especially in patients with kidney dysfunction. Furosemide reduces the kidney excretion of lithium and can lead to lithium toxicity. Furosemide may impair kidney function when administered together with aspirin or other nonsteroidal anti-inflammatory drugs (NSAIDs). Periodic blood tests are performed to monitor kidney function and electrolytes during treatment with furosemide.